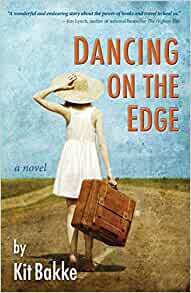 Twelve year-old Dot is spunky and full of zest for life, but after her mother's sudden and senseless death, she finds herself dancing on the edge...of everything. With all familiar anchors swept away, Dot is propelled with her offbeat aunt on an international voyage of curiosity...and maybe even time travel. With a little help from Jane Austen, Mary Shelley, and other trailblazing ladies of literature, Dot's trip to England becomes anything but predictable. Pack your bags for a memorable, powerful journey into life in the wake of profound loss, as our young heroine discovers the meaning of her past, and of her mother's greatest gift to her. "A wonderful and endearing story about the power of books and travel to heal us. ...A perfect mother-daughter book." Start reading Dancing on the Edge on your Kindle in under a minute.